Even the most attentive movie-watchers – students of cinema, dedicated to exploring the nooks and crannies of the form – sometimes look at a film mainly in terms of its high-profile elements: script, acting, cinematography, editing. It’s when you actually spend some time on the sets of a movie, and watch the darn thing being monotonously assembled, that you begin to appreciate the small but vital cogs. In Kerala, at the location shooting of Anup Kurian’s The Hunter last month (earlier posts here, here and here), I had a chat with Sarah Eapen, the film’s costumes-in-charge. Sarah’s notebook was full of charts for each day of the shooting, subdivided by scenes and characters, with little icons representing different sorts of T-shirts, scarves and so on. (The scenes involving elephants and cows had little smileys drawn beneath them, because she didn't have to attire those lumbering beasts of the wild.) But her job wasn’t merely to take actors’ measurements and collect outfits. She had to read the script carefully and think about the characters’ personalities: would a flamboyant hitman wear a bright pink shirt without stripes? Would a young medical student use red nail-polish or a more sombre shade? On a small production like this one, she also had to keep an eye on aspects of art direction and continuity. For example, in a scene where two people bury a beloved dog, she decided to use an old tribal shawl to wrap the body in (it chimed with other tribal associations in the script) – but this in turn made it important to establish the shawl as part of the film’s mise-en-scène, so it was shown being used as a makeshift tablecloth in an earlier scene. And then there are the mundane tasks such as “ageing” newly bought clothes. Most of us don’t even think about these things while watching a film, but for a designer it entails creativity of a different sort – fraying the edges of trousers just so, ripping pockets delicately, even dipping clothes in tea and coffee to make them seem faded! Sarah, working with a very small budget, joked about how such things are taken for granted on bigger-budget movies, where they have “Ageing Departments”. 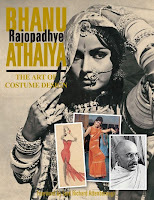 No wonder then that Raj Kapoor, Guru Dutt and other directors of the time were taken with someone like Athaiya, who had not only studied art but had also traveled widely enough to know firsthand about regional trends in clothing and design. “I had an understanding of culture,” she says with quiet pride. Directors would narrate a scene to her and she would make a sketch within an hour and show it to them. At the same time, when a costume designer is permitted a high level of involvement in the scene-by-scene planning of the film, the results can be subtly effective. 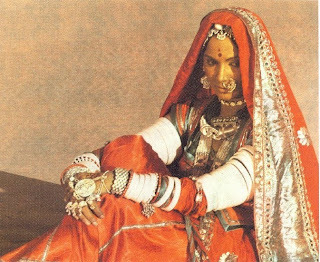 Using brightly coloured outfits for cheerful early scenes and gradually moving to duller shades to reflect the darkening mood of a story (something she did in Raj Kapoor’s Henna, for example) can establish atmosphere and provide visual cues, even if viewers register it only at a subconscious level. 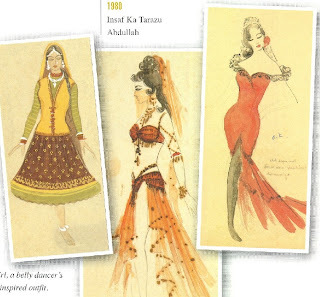 As for the book – well, it’s very good to look at, with dozens of movie stills featuring Athaiya’s most iconic costumes: a fish-scale dress worn by Nargis in a dream sequence in Ek Tha Raja Ek Thi Rani (see pic), Sadhana’s form-fitting kurtas and churidaars in Waqt, Sunil Dutt and Vyjayanthimala’s period costumes for Amrapali, Waheeda Rahman’s bridal outfit in Reshma aur Shera. It’s priced at a steep Rs 2,500, but that’s the norm for a publication of this sort. The one thing I definitely didn’t like was the eight-page promotional spread for Tanishq Jewellery, blatantly inserted right in the middle, though it had no direct connection with Athaiya’s work. pongam: no, it's Waheeda Rahman. 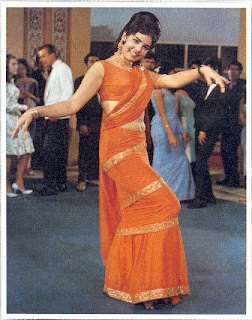 Raakhee, also dressed as a bride in the same film, is on the book cover (the first photo on this post) - they look surprisingly alike in that get-up. You have to be a very disciplined person to update your blog so regularly...and largish, well-thought out posts on a variety of subjects at that...in addition to your freelance journo work. Very admirable! Anon: thanks - but most of these posts are versions of things I've written for various publications anyway, and putting them on the blog doesn't take take up too much time. I loved this post. The fancy award functions, the write-ups on movies, etc, have all but missed the credit due to costume designers. Of course some of them get unnecessary attention, but that's thanks to their links to mainstream fashion designing. Bhanu, for instance, has been largely ignored; apart from the Oscar, her work hasn't really been spoken about. I remember coming across a tiny newspaper article which mentioned Swades to be one of her works. One look at Shah Rukh's shirts, esp. those blue checks, or pale trousers, and you know this character is based in the US! Very thoughtful of you to throw light on this topic. Thanks! Meghana: glad you liked it. Of course, the Vagamon shoot was an eye-opener regarding many other "smaller" aspects of movie-making too; hope to write about them sometime. 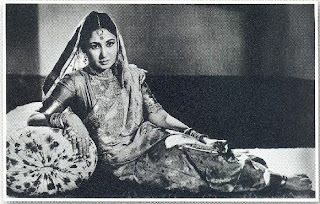 "Meena Kumari in Bengali sari"... would like to find out more about the Bengali saree bit. Is there a saree for each state? A Bihari saree or a Marathi saree perhaps.